The arrival of the five Dacobots on Earth was a turning point in their lives - step by step, they learned a lot about the human traits and the earthlings' way, especially about children. That gave rise to their great fascination with the complexity of earthly beings, on the one hand, and to their decision of settling in here to find out even more, on the other. The five robots have considerably increased their knowledge of the ways in which adults and children can learn effectively. Moreover, they became aware of the fact that the manner in which information in conveyed is as important as the information itself when it comes to education. The robots therefore decided to join their efforts to create elelarning games! The Dacobots reached the conclusion that every educational activity becomes even more effective and efficient when game elements are included in it. For that reason, after completing each game or presentation on the Dacobots portal successfully, users are rewarded with a playing card. However, the robots realized that the reward system described above was not enough, as they found it to be too traditional and didactic, despite the brightly colored imagery of the Dacobots playing cards. As a result, they added a new feature to the platform - a user rating system meant to nurture the inner competitiveness that children have. Each user can view his or her rank by scrolling all the way to the bottom of the main page. The rank and evolution of each user are acknowledged on the portal not only through the number of acquired points, but also through an avatar that grows and changes its appearance as the users earn points and collect playing cards. Immerse youself in the Dacobots universe with the new avatars, which are shaped like robots! Two types of avatars are available - one for boys, and one for girls. The avatars start off as babies that have just hatched and continue to grow as children gain knowledge by playing the elearning games on the portal. There are 13 stages in their evolution at the moment. 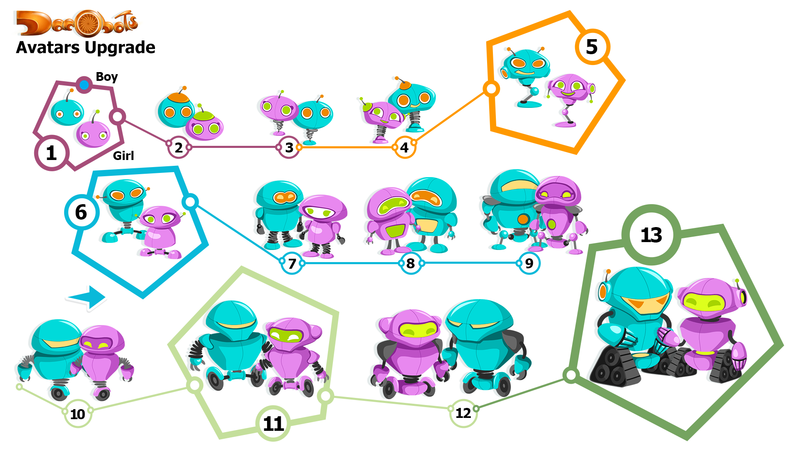 Create an account on the Dacobots.com portal, play the available elearning games and watch your avatar grow!